Pluto in Capricorn has reached its zenith point in the sign and will move ever so slowly ahead, away from that 15th degree by December 3rd, just before the people of Standing Rock face their potential removal from the land they have occupied in protest of the Dakota Access Pipeline near the town of Cannon Ball, North Dakota since August. I am posting the December 5th ‘closing date’ below. Let’s take a look at some of what it may mean for all of us. 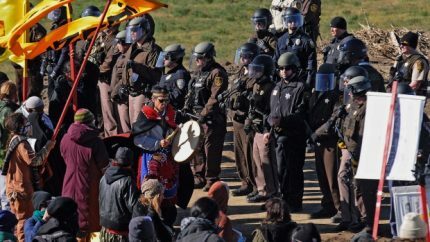 According to the Chairman of the Standing Rock Sioux Tribe, David Archambault II, the letter issued on November 25th by the U.S. Army Corps of Engineers announcing its plan to close the campsite land is probably meant to reduce the government’s liability. The types of injuries that you see below would then fall on the tribes to assume. This chart shows the Sun still conjoining Saturn in Sagittarius, both in square to Chiron in Pisces. It symbolizes the challenge of taking a stand for truth and healing. So which side here has the most truth and healing energy I ask? Each of you readers must decide that for yourself. We are all being asked now to go deeper into the issues of what matters most to us. 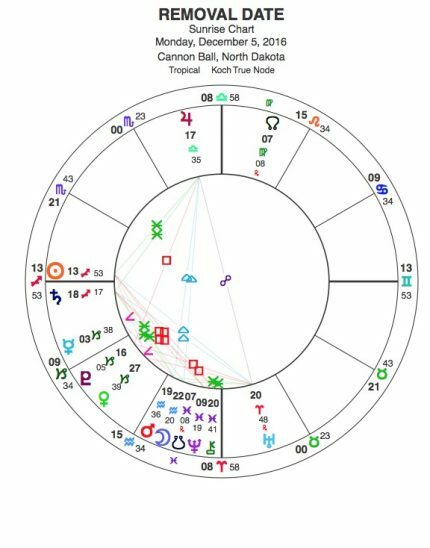 There is a prominent T-square in Cardinal signs in this chart re-emphasizing the Pluto/Uranus square that is now separating, but still charged with energy, and adding in the Jupiter in Libra factor which leads in this bowl patterned chart. Jupiter in Libra asks us to look in our hearts for what is now just and fair. 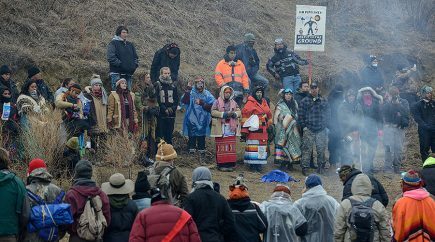 The leaders of the Lakota state over and over again that they are NOT victims. They state that they are powerful because they stand in their truth of staying peaceful, prayerful, and non-violent. They tolerate no guns, alcohol, or drugs in the camps which have been set up. They believe in the power of prayer. They will not leave. They have taken their stand. On December 5th Jupiter is in trine to both Mars and the Moon in Aquarius. It is also in sextile to the Sun and Saturn in Sagittarius. Something can be won on that day which is bigger and more comprehensive. Walking in balance is a difficult thing sometimes, but it is easy when you go in to your own heart and find the most loving place you can find. Jupiter in Libra is ruled by Venus. Venus has just finished conjoining Pluto and is about to leave Capricorn. She has been in the Cardinal T-square dynamic of late. Capricorn energy can represent many, many things, but it is an EARTH sign. Deeper than the state, deeper than institutions, deeper than man-made structures lies the EARTH. Capricorn is mountainous earth. What is being stated here? 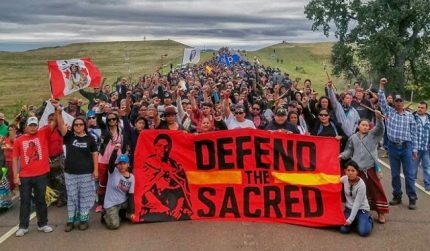 STANDING ROCK…..SACRED STONE. What is more sacred than the Earth I ask? 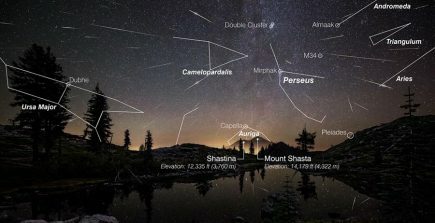 We are all inhabiting these earth bodies even if we are also connected with the stars. When we die our bodies return to the earth. The earth gives us EVERYTHING that sustains us in this life in terms of food, water, clothing, and shelter. All of our resources come from the earth. The message of Pluto in Capricorn is far deeper than politics, economics, or who is in power. It is that we need to honor the earth and place her first, or we lose everything in these bodies that we inhabit. I listened this morning to the press conference delivered by the Standing Rock leaders. 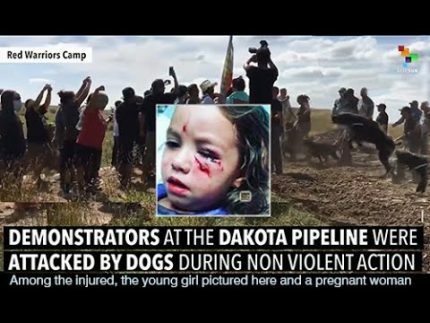 I encourage you to go to YouTube or any of the many sites such as Sacred Stone Camp, Standing Rock Agency, or just Google the name, and listen carefully to what these brave and wise souls say in this public gathering. The young man, Thomas Lopez, Jr., a Standing Rock tribal member and an early organizer with the International Indigenous Youth Council spoke so simply and eloquently. 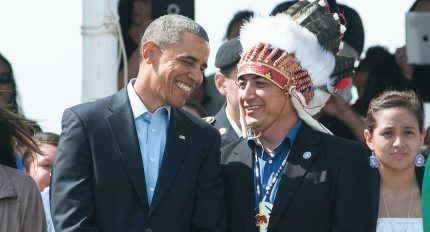 He addressed President Obama by stating, “You promised you would protect our sacred way of life. And here we are protecting that sacred way of life. And where are you? You are in silence.” He also went on to say quite clearly that they are the rocks and they will not move. He quoted a Chinese proverb also that said that mountains stand firm. And that is exactly what he and the youth of Standing Rock are doing; standing firm like mountains! Pluto in Capricorn is now moving into a sextile with Chiron in Pisces. What is the deeper meaning of this repore? WATER IS LIFE. WATER IS SACRED. Without water we can not exist on this planet. We need clean, pure, life-giving water or we die. These are simple, deep truths that we can no longer ignore. Chiron, as a harbinger of sacred medicine, as a bridge from Saturn/ego consciousness to Uranus/cosmic consciousness, is trying to bring this message home in various ways. Standing Rock is a vivid and real example of this. Sun just crossing over the Sibley Chart Ascendant with Saturn now solidly in the 1st house. The first house of a nation’s chart is the nation itself and its people. It is also the image that the nation sends out to everyone else. What sort of image is going out to the rest of the world now regarding America? With the transit of Jupiter in Libra now moving through the 10th house of this nation’s chart, the governing body, the prestige of the country and its ruling class is being enlarged upon. Transit Jupiter has just crossed over Saturn which implies the authority of the land, it’s history and traditions. Are we a peaceful nation? Many like to believe we are, but to the original inhabitants of this land there is a big question looming right now. Are we a law-abiding nation? 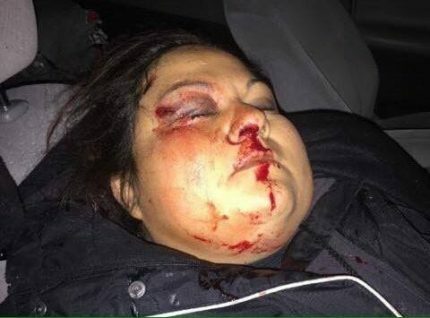 Many like to believe we are, but to the original inhabitants of this land, there is a trail of broken treaties to still be addressed, as well as the legality of what is now taking place on their sacred lands. I hope I can write about this later by looking at the original Treaty of Fort Laramie. Jupiter over Saturn does imply a new beginning, Will this be a beginning where fairness, balance, and true justice are honored? Transit Uranus is hitting squarely Chiron in Aries in the 4th house which represents the land, the earth wealth of the nation, the weather (!!!) and the party no longer in power who oppose the one now in power. Look at that! Big changes indeed. Chiron in Aries in this nation’s chart shows many things that are good. It shows the bravery and courage it took to create this great nation in the first place. It shows the pioneering spirit of the early settlers who pushed West. But it also shows the wounded search for a true identity in terms of what Chiron in Aries really represents which is the Sacred warrior, healer, teacher. The people who inhabited this land for thousands of years and honored the sacredness of the Earth are also this Chiron in opposition to the rulers of the nation. They did use that word sacred and still do. Does anyone in the governing body of the United States actually use the word SACRED? Does anyone honor the true meaning of that word? Sacred—Holy—Hallowed. So we have a tremendous pressure building in this unfoldment of Standing Rock and all that it now represents. Is land sacred? Is water sacred? Is life sacred? On the very day of the closure the Moon is aligned with the nation’s Moon in Aquarius. The Moon in a nation’s chart symbolizes the general public, the people, the communities, but most specifically the women. What an apt time for so many women to be involved in taking a stand. The Moon in the nation’s chart is inconjunct both Mercury and Neptune in the 3rd house which represents both communication, education, and ‘bridges’. A bridging is going on that is heartening and empowering of the many, for Aquarius is about ALL of humanity, not just the few. Aquarius wishes to embrace and empower everyone to have a voice, not just the few. This is happening more and more. 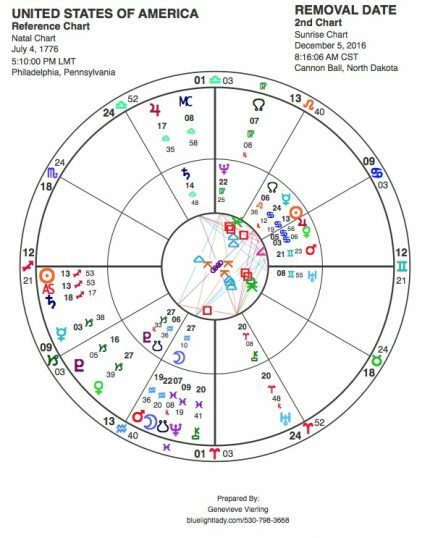 Finally, we see transit Pluto slowly moving through the nation’s second house which is all about America’s monetary wealth and systems as well as it’s deep underworld connections with power. Pluto may also represent decline or regeneration. It is obvious that the Sioux and 748 Tribal Nations are declaring a regeneration, a resurgence of their own power. This can be actually seen in the Treaty map as a transit of Pluto now in trine to the original Pluto in Taurus in that map. On the very day of December 5th, Venus conjoins the natal Pluto of the nation’s chart. Which will it be, the love of power, or the power of love? Which will ultimately prevail here? Each of us has to look at this great drama unfolding and ask ourselves where we stand in it all? And each of us in this process must ultimately face WHAT DO WE VALUE MOST? For all of this has to do with VALUES =VENUS. And as a final aside, keep in mind that the crude oil meant to travel through this 1200 mile pipe-line is going to China. Chew on that a bit and ask yourself, who profits? China does produce almost all that we now consume, consume, consume. So yet another question then becomes what do we like to consume? And that, my friends, goes right back to what do we value?? Sustainability is now an enormous issue facing us all. Our future generations and the planet itself need us to decide what is most important right here, right now. The stars seem to be describing this decision process most vividly. Thanks, Genevieve, for so skillfully drawing astrological attention to this important event, and asking some of the hard questions that underlie it. I love the astropoetic correlation you made between Pluto in Capricorn and Standing Rock/Sacred Rock. What does the US stand for? What do we hold sacred? What has become of the original vision that inspired the American experiment? Has that experiment succeeded? Or has it failed? One cannot help but believe that as the US nears its Pluto return – shortly after the next election – we will face a time of reckoning. 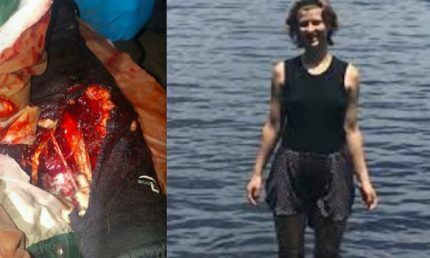 Perhaps what is happening now at Standing Rock is a harbinger of that. I appreciate your feed-back and comments Joe! Genevieve, you are so spot on with this article. And then we have the Trump factor to contend with. Important moments in our history for sure. Every thought counts and so should every vote. I am praying things take a turn for the better for this nation. Thanks for your feed-back Lisa. I value what you do in the art world so much! Genevieve, what a timely article. Thank you for writing it as it is always so helpful to get an astrological overview of these major events. Although Pluto is slowly moving over this nation, it does sound hopeful that regeneration may come out of this. Not only for Standing Rock, but for all of us. Thank you Connie! I sincerely hope so.